Ever since Ritchie Blackmore speculated about doing a couple of RAINBOW shows in 2016, hopes and expectations have lead to very emotional disucssions between fans. To the disappointment of those hoping for one of the former lineups to reunite for the gig, Blackmore didn’t go the easy way and – as often – assembled a new team of musicians to accompany him on this adventure. The band finally announced consisted of current BLACKMORE’S NIGHT drummer David Keith, former BLACKMORE’S NIGHT bass player Bob Nouveau, BLACKMORE’S NIGHT contributor Jens Johansson and LORDS OF BLACK singer Ronnie Romero, which lead to even more discussions between fans and even former RAINBOW members with Joe Lynn Turner claiming the planned lineup will be “a Ritchie Blackmore band, but certainly not Rainbow” overlooking the fact that RAINBOW has always been what Ritchie Blackmore wanted it to be. Three shows took place, two open air shows in Germany at Loreley and Bietigheim while the third show was staged at the Genting Arena in Birmingham, UK. While the two German shows were recorded on audio and video for a later (November 18, 2016) release, the UK show wasn’t recorded, which is unfortunate as it did not only feature the most consistent band performance of all three evenings but also was the only show featuring “Soldier Of Fortune” and “Burn”. Sadly, the CD booklet doesn’t explain which song has been taken from from Loreley and which song has been taken from Bietigheim which is odd as the second CD contains some bonus tracks from the “alternative night” (which one?) and introductions like “You wanna sing with me, Loreley?” are still included. Despite all the discussions about the musicians on stage, the setlist had been the major point of criticism, including way too many DEEP PURPLE songs while leaving out a bunch of RAINBOW classics. I won’t repeat details about the performance which have been already covered in my review of the Loreley show, but one of the major surprises on the CD is Jens Johansson which – now being clearly audible – does a far better job than my memories of the show suggested. For a current release, the CD offers an enjoyable sound with clear dynamics and a well-balanced mix between each instrument. Is “Memories in Rock – Live In Germany” an album worth buying? That’s a question hard to answer. 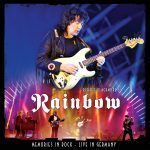 It’s a good live album, but for a band as RAINBOW, good just isn’t good enough. There are more impressive live versions of almost every song out there which leaves the group of potential buyers to completists, people being curious how RAINBOW sound in 2016 and those who attended at one of the shows now being offered a perfect souvenir. Posted by andreas on Sunday, October 30th, 2016, filed under Blog. You can follow comment on this post through the RSS 2.0 feed. You can skip to the end and leave a comment. Pinging is currently not allowed. Effectively, I’m desapointed with this cd. I was at lorelei, and it was pretty shocking, which was so sad. I still don’t accept Blacker’s taking money off of me for turning up unrehearsed, and his playing was definitely NOT great. Birmingham however was amazing in comparison, one of the top 2 best gigs ive ever seen. Birmingham was brilliant, just hope he does it again! A lot of critics out there, but it was good to see/hear Ritchie playing rock again. Dio’s no longer alive; Romero was a good replacement. But it still felt a little bit like Ritchie playing with a karaoke group. Nonetheless, better than just about anything else on radio/TV nowadays. Just my perspective from the U.S. Maybe the music scene is better elsewhere. But it’s totally collapsed here. Not since the promo vids for The Purple Album do I recall such vigorous & polarized commentary about a forthcoming release.If you buy Memories In Rock,enjoy !! Birmingham was great…travelled for the concert all the way from Mumbai.. Calling this Band RAINBOW is an Insult to the History of the real RAINBOW. Although the singer Ronnie Romero was Excellent, the rest of the band including Blackmore was NOT. To me they sounded like nothing more than a band cover band. I will NOT be Purchasing this. I have held back from commentary regarding this package and outing till now so that I could really reflect on it all and do so without long winded jibber-jabber. So here goes. Watching many clips from YOU TUBE and now these 2 official video preview offerings only solidifies then points that I made back at the announcement of this now historic venture. My main point was this…. No New Album leads to nothing more than a Covers/Tribute Band. Since the only songs that were played at these 3 events were old Purple and Rainbow songs, the band had no identity of their own and thus it becomes strictly a comparison issue to the original. Had they written some new material and offered some original songs in the mix (mostly), then it would have been Present Rainbow promoting and playing new material and then of course, playing some of the classic tracks fans would long to hear. I said it then and I say it again…. HUGE MISTAKE going out like this. No Rainbow line-up EVER played a gig without an album under their belt. It is what makes it real and gave that line-up their own Place In Line. New songs with this line-up would have made a big difference in how the whole thing was received. With all due respects, I actually don’t have too big of a problem with their performances. Their lack of identity to songs of their own is the issue. The Band is the Band and all they needed were songs other than just old songs to convey to the world that RAINBOW lives on. Instead we get Blackmore and his little band of gypsies doing old stuff. I’m sure there would have been more fire in the basement had they been motivated and inspired by playing their own stuff and officially owning a RAINBOW title. In this case “Under the Rainbow” is suffice. I do believe it is worth the listen and purchase. I am very pleased that the TMIB did it. Really glad he didn’t do the JLT thing. But, STILL I’M SAD that they didn’t go into the studio first and do an album. In retrospect to realizing the actual line-up… All members or prior members of BN, including Candice on background vocals except for the singer, it actually would have made more sense to just make it a Blackmore’s Night “Purple/Rainbow Tour” as Whitesnake did with the “Purple Album Tour”. It truly was more of a BN gig than a Rainbow gig. He can do 2 separate ventures now. They can tour as Blackmore’s Night doing all the ‘Pointy Hat/Green Leotard’ stuff an then tour as “Blackmore’s NIGHTMARE” playing heavier Purple/Rainbow stuff. I don’t care how much you lot of wowsers criticise this album, I’m still going to buy it, it’s good. Whitesnake’s Purple Album copped bulk heaps of whinging & poor reviews before & upon its release… & yet it has gone on to become one of the band’s best selling albums. Explain that!. I played the 2 tracks released from the ‘Memories In Rock’ dvd for a friend (an AC/DC fan who was unfamiliar with Rainbow’s music) the other day & his opinion was that they sounded quite good. So there. At this point, I would like all the whingers to imagine me poking out my tongue & blowing raspberries at them!. If the only complaints expressed about this album are the mere handful that we see here in The Highway Star, then I think ‘Memories In Rock’ will sell lots & lots of c.d.’s & dvd’s. Actually, I’d love to see & hear a full concert of Rainbow songs performed by Blackmore’s Night!. Check out BN doing Stargazer live in Arlington 2016 on Youtube, Candice certainly has the lungs & voice for it!. Rainbow Moon… or Rainbow’s Night?. Or possibly Rainbow fronted by Candice?…. my mind is blown. Big creepy clown smiles to ya!. I attended the Uk show and was pkeSed to see Ritchie happy and clearly enjoying the show. There were some memorable majestic solos, ok he didn’t smoke up the fretboard but the touches were still there – at 71 I would be happy with that! The vocalist was ace. I been a fan since 1977, I just have so much respect for Ritchie. Most Peale enjoyed but there are always knockers……. Birmingham was brilliant. Hope he comes back with Rainbow to the UK. Seen the band with most line-ups and reckon this was up there with one of the most enjoyable performances. As a matter of fact I’ve just been watching Uriah Heep live at Koko,in London .Talk about a powerful band..One of the last band of the 70′ who still can deliver the goods. That’s what I call a rythm section..and sure Phil Lanzon can rock the Hammond.Mick Box is 69 but he still rocks.Ritchie should take notice..
@16 Byron, if you thought the Heep were good, then check out Ken Hensley- Live in Norway (Full Concert HD) on Youtube. I guarantee you’ll love it. Because I did!. Tracy @ 10 & 11, then to draw a parallel, if a divorced father marries another woman & they never create babies together (but they still go out to dinner with the husband’s children from his previous marriage), does that mean that his new marriage is somehow invalid & doesn’t count?. Mate, without meaning to piss in your pocket… Tracy when did you decide the rules by which all the rest of us must live?. I reckon that Mr B. & his missus are the most qualified to decide what’s right or wrong for them & theirs. The rest of us just come along for the ride, or else we catch a different bus!. Anyway, big smiles to ya. I was at Birmingham, and I really enjoyed it. RB is a senior citizen now, maybe not in the best of health, and watching him play ‘Burn’ was a bucket list moment for me. I saw Rainbow (with the rainbow and Dio) in Glasgow in 1977 or 78, and of course he’s not the man or the player he was then – and neither are any of us who were there that night. Cut the man some slack – he seemed to be enjoying it, the crowd loved it, and I thought Romero was great. I’ll miss him when he’s not playing any more – he’s been the soundtrack to much of my life. Ah, with a moniker like “Byron” what other band should you see? Not knocking the Heepsters (“poor man’s Deep Purple” with catchier tunes and big backing vocals, less instrumental giftedness or noodling, depending on your taste of course). I’ve seen them often, they are a great live band and I have all their albums thru the years. I do miss Trevor Bolder’s busy bass playing – live he was their lead guitarist one octave lower – terribly though. That said, the new guy is good too, just not (yet?) as extroverted as Trevor was. And you’re right, Lanzon really digs into the Hammond, he has the most aggressive (and overtly loud!) Hammond sound of any band currently still playing I can think of. Not a virtuoso like Don Airey (though Don’s playing has become meatier with Purple too), more like a Rick Parfitt of the Hammond AND THAT IS NOT A KNOCK!!! In fact I’m due to see Heep playing with Quo (lamentably sans Rick, but multiple heart attacks again and again should tell you when it’s time to stop) soon. byron@16, The Heep continue to put out fantastic recordings. I do not miss a gig when they tour The States. Was beyond bummed when Trevor passed. One of the greatest bass players to have ever stayed under the radar…. A quand une tournée des maisons de retraite, Riri ? I am not going to answer your Parrallel regarding the divorced wife and kids example… too close and dear to my own personal life, but I will answer your next question…. I am NOT setting the rules here or there or anywhere. Just making an actual, factual point regarding RAINBOW. Hell I can even go one further… PURPLE. Never in the history of RAINBOW or PURPLE has an official line-up change happened or been introduced without a studio album to promote said line-up. NEVER BEFORE! So, I back up my point one more time with the FACT that this was just a Blackmore Gypsy Band…. “Blackmore’s Nightmare”. All is forsaken here with the overwhelming bitching and whining about how bad all the songs were played. You know why? Because All the Songs were Songs from the Past and nothing NEW and INOVATIVE came from it. So all folks did was COMPARE. When you bring in your own ORIGINALS, there is nothing to COMPARE to, thus they are given a whole new LIFE and RESPECT. Never before?… Oh brother!… Never say never, there’s always a first time for everything. In any case, every version of Rainbow etc have always continued to play their same old songs, they’d get booed if they didn’t!. Yet people still compare them to previous incarnations & performances. Often, new songs in the live set get put down for not being as good as the old songs!. When DP spend 6 or 7 years touring without new material, it takes nothing away from them, I still love ’em!. Mate, you need to get some XXXX brand beers in ya, they’ll wear away some of those stubborn bumpy bits!. Keep on truckin’ buddy…. Being lazy, not having rehearsed really, still cashing in. Nothing wrong the spirits I ingest or my point you seem to ignore. But I will even go another round with you in response to your new input. LIVE every LINE-UP always played a song or 2 from their respective album. Yes they of course fell back on the prior hits or faves but would never play a gig without doing something from their present at the time lie-up. PURPLE TOO. Don’t know why you are hell bent on shooting down these actual FACTS. Are you objecting to my point that it would have been better had they offered something new? Yes, of course the folks would beg for the old standards also, but shoving something NEW at the crowd is what makes the band current, relevant and authentic. In the case of what they did, Nostalgic is all it was and barely even that with how it went down…. I guess nostalgia isn’t what it used to be… I’m not disputing what RB & various crews, or DP have done in the past, I’m O.K. with all that. I also would have liked & still desire another album from TMIB under the Rainbow moniker. Maybe he will have a change of heart & give in to us, the ever hungry fans… He’s unpredictable. That’s part of why I admire him so much.. just let the old fella be & watch what he does…. like in a nature documentary!. No, the music isn’t current, but it is relevant to those of us who care about such things. As for authenticity, well he wrote the tunes that he played, so it doesn’t get more authentic than that!. I guess what it comes down to is how strongly you feel about hearing something new from Mr B… & you do feel strongly about that issue feelingTracy!. That & how he played at the 3 events. I don’t feel the necessity or urgency of a new album as you & others do, but I do understand. I reckon an album or E.P. would be great, but I’m not holding my breath for one. People want there music presented with an air of excitement & the players to ‘give it some juice’. I didn’t need that, I liked what he did. I must be turning into a vegetable or something, a symptom of my age & lifestyle, fat & lazy. Anyway, be happy & smiles to ya!. I for one am glad to see my hero and idol Ritchie Blackmore playing rock again if just for 3 measly shows, and I unlike some other people am not pissed off that they didn’t do an album first, sure that would have been great, but his intention was to just do 3 or 4 shows for the fans who have never seen him play the deep purple and rainbow classics before. As for the band, it would’ve been cool to see joe with him, or roger, or any rainbow alumni, but, no rainbow lineup ever did more than one album anyway so who cares, rainbow has always had constantly changing lineups, and has always been RITCHIE’S band, and as long as Ritchie Blackmore is on guitar with a strat in his hand and playing rock and not pre baroque music I’m tickled. Took me a while to come around to purchasing this one, but I have now. At first I felt Ritchie was playing too slowly, but he actually does fairly well. Looking back at some of his performances from the 80s when he just rushed through the songs and they sounded NOTHING like their studio versions, I actually prefer his restrained approach on these live shows. Romero is an excellent singer. Definitely did not want to hear Doogie White again (not that I dislike him) and Joey Lynn Turner is a geezer now and had started to lose his range already by 1995. So a new singer is welcomed. There really needs to be another live recording and some concerts with Romero on the Turner catalogue: Death Alley Driver, Street Of Dreams, Stranded, Stone Cold. Skip the Dio stuff- it’s been done too much.